February 12, 2016 - Lufthansa, together with Airbus and the Pratt & Whitney engine manufacturer, celebrates the delivery of the world’s first Airbus A320neo. Carsten Spohr, Chairman of the Board and CEO of the Lufthansa Group, Airbus President and CEO Fabrice Brégier and the President of Pratt & Whitney Robert Leduc invited 700 guests and media representatives to the official delivery at Hamburg-Finkenwerder. Following the ceremonial handover, the first two new-type airplanes were presented to the public. The first A320neo, with the registration D-AINA, has already flown scheduled service since January. The second “neo” is expected to complement the Lufthansa Airbus fleet soon. The first experiences with the A320neo clearly show that the 15 percent lower fuel consumption mark has not only been achieved but even slightly exceeded. The significantly quieter engines also increase customer comfort on-board and provide relief to residents near airports by reducing noise emissions. The development and introduction of the quietest and most fuel-efficient aircraft on short and medium distances is further evidence of the successful cooperation in the aviation industry at European level. “Europe has been a leader in this fascinating industry since the early days of aviation,” says Carsten Spohr. 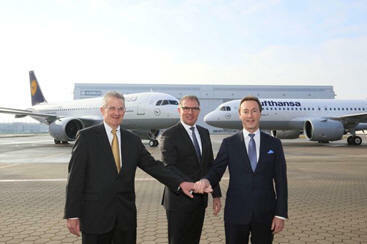 “Lufthansa and Airbus have developed a trusting and productive 40-year partnership. This afternoon, the A320neo will take off from the Airbus facilities in Hamburg-Finkenwerder as a special flight with flight number LH9917 with guests and media representatives on board and fly with a short stop in Hamburg’s City Airport Fuhlsbüttel towards Frankfurt. The A320neo was fitted with a special logo. “First to fly A320neo - Less noise. Less fuel. Less CO2“ adorns the rear fuselage of the Lufthansa aircraft.